It’s good to be reminded that everything is subject to change. The things we take for granted as normal and constant because they have been so for such a long time are all transitory. In my World Civilizations classes this week we covered the human migrations that occurred during the last ice age before warming temperatures submerged the land bridges connecting Siberia with Alaska and Southeast Asia with New Guinea and Australia. Global warming (and cooling) comes with the territory. Given the reasonable argument that we are in a warming stage now that is causing sea levels to rise, I have found myself wondering how long before the Pacific would swallow flat-as-a-pancake Wake Island whole. Historic war ruins, memorials, buildings and beaches, all would slip below the surface, leaving scarcely a ripple behind. Presumably humans would have had the good sense to depart the premises earlier. Which brings me back to the little coral organism and its skeletal calendar. Thousands of seamounts rise from the floor of the Pacific Ocean, many of them topped by coral reefs. The seamounts are old volcanic peaks supported by large geological plates that are gradually sinking. A fringing reef forms first around the volcanic islands and, as the plate sinks, the coral reef grows outward and upward. Eventually the volcanic island submerges, leaving a shallow lagoon ringed by an atoll, like Wake Island. One can assume that this process will result in a lovely coral atoll topping Hawaii’s Mauna Loa someday, probably long after any human beings are left on the planet to admire it. So we have several (doubtless more) concurrent forces operating, albeit at miniscule rates of speed: geological plates settling, sea levels rising, and coral skeletons growing. My non-scientific conclusion? Wake Island will be around for a while. When I dove on Wake in 2011 I was amazed at the variety of coral and the rich and colorful reef population it supported. I readily admit that I don’t know many coral species, so I won’t pretend to offer an accurate description of Wake’s corals. My assumption is that the reef environment is in line with Wake’s Micronesian neighbors, which include the Marshall Islands due south. A quick surf of the web reveals that NOAA, NCCOS (National Center for Coastal Ocean Science), and other agencies and institutions have been engaged in Micronesian reef research for a number of years. In this region over 170 hard (stony, reef-building) coral types have been identified, as well as a number of soft corals. As the coral animals combine in colonies and their hard skeletons grow, they produce an infinite variety of shapes and colors that hosts a vibrant population of fish and other creatures. 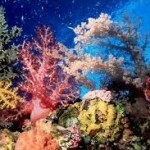 Coral reefs grow naturally but air bases do not. And in eons past the industrious little polyp was not at all co-operative regarding the inclusion of natural harbors in the atolls which rose slowly above the waves to crown what were probably ancient volcanoes. Hence considerable rearranging of local topography is generally necessary before an atoll can blossom out as a full-fledged air base. Pan American Airways initiated the process of “rearranging the local topography” on Wake Island in 1935 by dynamiting enough coral heads in the lagoon to create a safe water runway for its transpacific Clippers. When the navy contractors landed on Wake in 1941, they knew that dredging channels and a turning basin in the hard coral would be the most expensive, time-consuming, and difficult work ahead of them. In my research for Building for War I quickly realized that the first “war” was against the coral: the humans used weapons including dynamite, draglines, and an enormous suction dredge that broke down frequently in the face of Wake’s fiercely resistant defender. One could say that in the end the coral won: neither the Americans nor the Japanese were able to finish carving a channel into the safe harbor of the lagoon. The atoll survived repeated wartime bombings, ships deliberately run aground and postwar oil spills and chemical leaks. Savaged and scarred, the coral has adapted to changes in the neighborhood, as it has for millennia, and survives and grows.